Jupiter: a massive, lifeless gas giant out there on the other side of the asteroid belt. It’s a behemoth, containing 2.5 times as much mass as all the other planets combined. To top it off, it’s named after the Roman king of gods. “This is all about fluids moving around on a rotating body,” said Norman Kuring of NASA’s Goddard Space Flight Center. In a press release, Kuring described the similar flow patterns as a combination of laminar (following a smooth path) and turbulent (uneven and chaotic). Ever since NASA’s Juno spacecraft arrived at Jupiter, we’ve been enjoying a steady diet of stunning images of the gas giant’s mesmerizing atmosphere, all captured by the JunoCam. Scientists are pretty sure than the planet has three distinct cloud layers, and it’s the interaction between these layers, and the planet’s rotation, that helps create the planet’s stunning atmosphere. 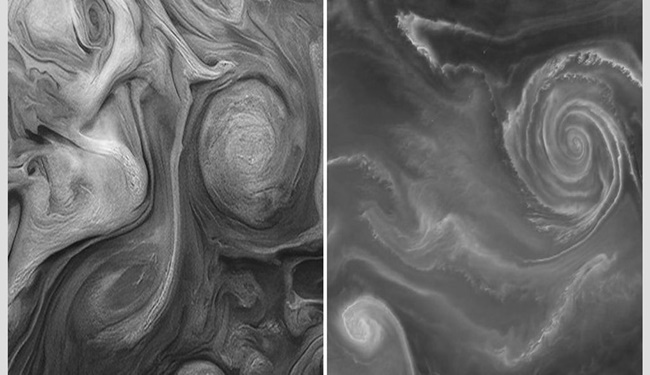 NASA has invited any interested people to use the JunoCam images and process them into works of art. They can then upload them to the JunoCam gallery for people to see. This Juno image was processed by Gerald Eichstädt and Seán Doran. The image was captured in December 2018 and then processed to reveal hard-to-see detail. The image of Earth is of the Baltic Sea near Finland, where a phytoplankton bloom is in full swing. When there are plenty of nutrients, and when temperature and salinity are just right, phytoplankton reproduces rapidly, sometimes changing the appearance of the water. The ocean currents created the swirling flow patterns in the image. The image was captured by the Operational Land Imager on Landsat-8.